This post is the first of a five part series. October 5 marked the anniversary of Steve Jobs’ passing. Many people remembered him as a visionary and the uncompromising leader who scripted one the greatest turnaround acts in corporate history. And many remembered his keynotes and the mesmerizing spell cast on people, called the reality distortion field. As I was reflecting further on Steve Jobs’ contributions, it occurred to me that, more than anything, Steve was a great Product Manager. He was, of course, the visionary and the uncompromising leader, and after all, he was one of the most charismatic CEOs in the technology world, but all that Steve was could be distilled down to two words – “Product Manager”. And, to put it in his parlance, he was insanely great at it. A great Product Manager takes customers on a journey – a journey of value. 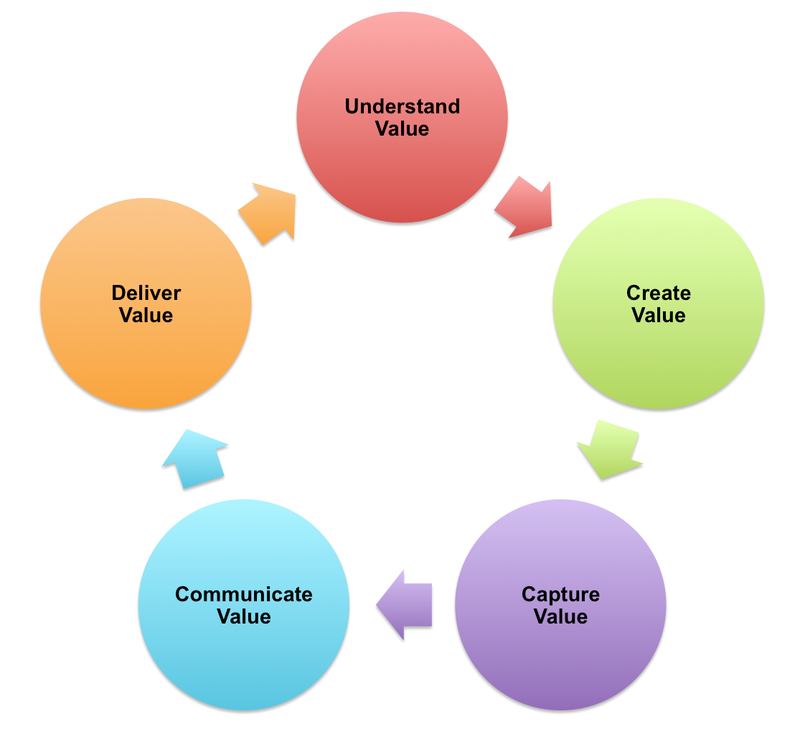 There are five parts to this journey called value management that characterize what product management is all about: Understand Value, Create Value, Capture Value, Communicate Value and Deliver Value. In the product management and marketing workshops we conduct at Adaptive Marketing, we anchor a lot of discussion around this value journey. Now, obviously, in most organizations, there are multiple people and teams who play a critical role in each aspect of value management, e.g. engineering teams create value, product marketing or pricing specialists capture value, product marketing communicate value and sales channels deliver value. However, the Product Manager is the steward of this entire journey, that’s where the buck stops, in my view. A good Product Manager provides the leadership to bring different stakeholders and teams together to contribute their best to this value journey for the customer. In this five-part series, we will look at each step of this value journey and find examples from Steve’s and Apple’s history (well, we could look at a number of other companies, but Apple is a lot of fun!). Obviously, Steve did a lot of things as a CEO, but we are going to look at only a few of them from the value-journey lens and glean some product management lessons. In this first part we will focus on Understand Value. The important point here is that value is always from the customer’s perspective. To grasp the notion of value, it requires a deep understanding of the market, different customer segments and what about your product is of sufficiently high value to them that they are willing to pay. This is of course easier said than done in reality. Let’s ask some questions that help to develop an understanding of value. 1. Is the Problem Worth Solving? Value can be traced to a set of problems. The challenge is to know what is the real problem and whether it is worth solving. Problems can be best understood by actually being close to customers, understanding who they are, and what makes them successful. It is about knowing what the customer is trying to achieve, in his or her environment, and whether you can do something that helps them in achieving their goal. Understanding customers, their problems, frustrations, likes/dislikes is a precursor to understanding value. 2) It just works right out of the box. Apple knew that people buying computers back then would value those attributes, and turns out, they still do today. The Mac vs PC commercials played these two values up heavily. As a contrasting example, anyone remember Microsoft’s SPOT (Smart Personal Objects Technology) initiative, which was a personal passion of Bill Gates? Microsoft pulled the plug on this eventually. You cannot blame Microsoft for trying, but this is an example of Microsoft having a very good understanding of technology and its capabilities, but not about the value people would get from having their everyday devices, such as watches and pens, made smarter by connecting them to the Internet. When Apple came out with the iPod, the prevalent situation in the industry was people downloading music illegally, and the classic methods of market research would not have necessarily revealed that people would have liked to buy music online and create playlists and carry all their music with them. This is where a combination of looking ahead to what consumers might want, coupled with the scale of the music industry that made it appealing to solve the problem of not being able to download music legally. Thus it is very important to define the problem accurately, and then evaluate whether you can solve it, and if it is indeed worth solving. 2. What will delight the customer? Things are packages of emphasis. Some things are emphasized in a product, some things are not done well, some things are chosen not to be done in a product at all. And so different people make different choices, and if the market tells us we are making the wrong choices, we listen to the market….We want to make the best product in the world for our customers….and they are paying us to make those choices. Jobs said this in the interview at D8 in response to the question about the decision to not support Flash on the iPad and whether this decision really served customers. But there is a larger truth embedded in here about deciding which features impact value delivered. We have heard a number of terms, Minimum Viable Product (MVP), must-have features and nice-to-have features, etc. So what is it that makes a product cross over from something that simply meets the needs and wants of customers to the stratospheric territory of something that delights customers? Apple has a strong track record of delivering customer delight because of their focus on creating delightful user experiences, which starts right from opening the packaging, even before the product is switched on. Again, this goes back to fulfilling the values of 1) Easy to use and 2) It just works right out of the box. But beyond these simplistic looking choices that drive product decisions, obviously, products have a whole host of features. So how do we achieve what Steve calls “packages of emphasis”? Which product capabilities have a disproportionate influence on delighting customers? In the 1980s, Professor Noriaki Kano of the Tokyo University of Science developed a theory for product development and customer satisfaction. I don’t know if Apple uses this model in its product development process, but the model is worth understanding to separate product features into four high-level buckets. Basic – Basic features are those that the customer takes for granted. Hence they may not be explicitly demanded, they are implied and obvious. Their presence in a product does not increase the value derived by the customer, but their absence erodes value. Let’s take the example of iPod and iTunes. iTunes is a basic feature of the whole product. Without iTunes, the iPod is not very useful. So in that sense, basic features are the threshold, they are must-have, they get you in the game, but they alone can’t help you win. Performance – Performance features follow a linear pattern, with better performance delivering better value. Continuing the example of the iPod, number of songs the iPod can hold, the size and weight of the iPod, battery life are all performance features. Any increments along these features tend to imply better value – more songs, more GB space, lighter iPod, longer battery life, etc. Performance features tend to be measurable and technical in nature, can be verified and compared against similar features of other products. Generally speaking, higher the performance features, the higher the price. The 32GB model costs more than the 16GB model. The company also incurs a higher cost for providing that performance, so at some point, the question has to be asked, how much more will the customer be willing to pay (how much more value is it to the customer) for improving the performance in this area? Excitement – Exciting features create an element of surprise, as they are not anticipated by the customer, but they may deliver a disproportionate amount of value to the customer. They meet needs that may not be expressed, and hence cause delight. This is where Apple excels, by creating a need that customers did not know they had until they see the product. Excitement attributes create sustainable competitive advantage. In case of the iPod, the click-wheel user interface would qualify as an excitement feature, because it allowed people to scroll through their entire library in a completely new way. Unlike Basic features and Performance features, the absence of Excitement features does not really diminish value, because they were not expected in the first place. Like Basic features, Excitement features may also be unexpressed, but that is again, because there is no expectation, and this creates the opportunity for delight. Indifferent – Some product features are indifferent to the value provided. For example, if Apple had provided some other means of buying songs instead of 1-Click, most people would be fine with the alternative. Similarly, most customers would be indifferent to the audio codecs and the encoding schemes used for songs. Time and again, as Apple has delivered blockbuster products, it has managed to deliver Excitement features along the lines of the two important values it tries to deliver: 1) Easy to use and 2) It just works right out of the box. It is incredible that they manage to delight customers consistently along these two areas. In part 2, we will look at the Product Manager’s role in Creating Value. « What If You Are Not Like Steve Jobs? Very interesting post, great material and well delivered. I am looking forward to reading all five posts. My career is product marketing, and I’ve worked for seven companies over the past 22 years. I’m not sure that any of these companies’ products ventured into the “excitement” zone. Closest thing to it was the email software that I marketed in the early 1990s. It would be very rewarding to be associated with an excitement product. Thanks Jack. I wonder if it is relative challenging to deliver Exciting features to the enterprise as compared to consumers. Typically what enterprises want – scale, throughput, efficiency, etc. – are Performance features – the more the better. Also enterprises want to know exactly what they are getting, because that is what they are willing to pay for. The other difference is that in most cases the enterprise buyer and user are different personas. This is why Steve hated selling to enterprises. Can you think of any enterprise product that has delivered Excitement features? Perhaps, the first Blackberry smartphone with the QWERTY keyboard that enabled corporate email on the road? You could say the QWERTY keyboard was an excitement feature, and many others copied it. As value evolves over time, this became a Basic feature, until the iPhone brought touch and on-screen keyboard. And now even that is a Basic feature. Looking at the Kano model though, it makes me wonder whether any of the successful companies with really innovative products that captured the markets and minds e.g. Google, Apple, Dropbox etc. really started with that kind of a map and said “Let’s build Basic + Excitement”. In almost every case, such methodologies always seem to be retrofitted to success. I liked a YouTube presentation by Guy Kawasaki on the “Art of the Start” wherein he dismisses these ideas and simply said what they wanted to do was build a great product that solved a small problem and not set out to conquer the world with a common cloud ecosystem etc. The fact that it became hugely popular was frankly because they got lucky (the word he used), and that is what he recommended to other start-ups. On another point regarding the value chain diagram for product management, what do you think of the Pragmatic Marketing approach to defining product management? Thanks Rajesh. IMHO, a model gives a certain way of thinking about something. We still have to do the thinking 🙂 – From my experience working in startup environment, you just don’t have enough data to be able to use a model proactively, at least in the initial phases. You typically have very limited customer inputs in order to evaluate if their needs fall along the Basic curve, Performance curve or the Excitement curve, but you do have to make those types of decisions, whether you can use a model or not. So you have to start somewhere. I agree with Guy Kawasaki that you need to pick a small problem that is worth solving for a reasonably large group of people who will be willing to pay for a solution. Take the example of the Lytro camera – http://www.lytro.com – Many people are not confident that their pictures will turn out great despite cameras having lots of features, options, etc. Lytro has only one button to make it a very simple interface, and it captures every single ray of light that passes in every direction through a scene. You focus where you want after you upload the picture. Its very cool. They have solved the problem of bad focus, bad lighting, slow shutter speed, etc., such that you will get a great picture every time. So you have to have a very clear understanding of the problem you want to solve, hence that is my first point. Re: Pragmatic Marketing, they have a good approach.